Front row, Samantha Wright, Morgan Didlake, Emma Kimbrel, and Sierra Yourist. Back row, Zach Murray (teacher coach), Ryan Turnipseed, Matt Yonkers, Conner Winterhalter, and John Andrew (attorney coach). 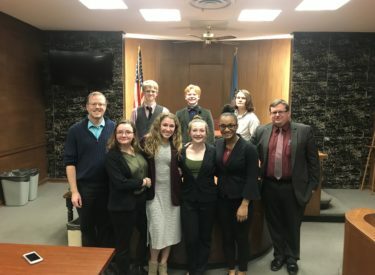 The Ponca City High School Mock Trial Team recently competed in a qualifying round against Victory Christian School and Coweta at the Tulsa County Courthouse. The Po-Hi Team presented the plaintiff case against Victory Christian and won both ballots. Matt Yonkers was named Best Attorney for the Plaintiff, and Emma Kimbrel was named Best Witness for the Plaintiff. The Po-Hi team presented the defendant case against Coweta and split the ballots winning one of two. Ryan Turnipseed was named Best Attorney for the Defendant, and Matt Yonkers was named Best Witness for the Defendant. The team will compete in a quarterfinals round against McAlester and Jenks on Friday, Feb. 15.